Vertical form fill seal machine makes four sided sealed pouches, a standalone vertical form fill seal machine pouch former with with pumps and augers for automatic loading of products. 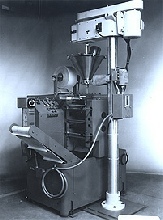 Vertical form fill seal machine - makes bags and pouches for packaging liquids, powders, capsules, vitamins, nutraceutical. Compact footprint for economic vertical form fill seal packaging. Variable tooling makes different size bags and pouches. Lean manufacturing, use the vertical form fill seal to make exactly the number of four sided sealed pouches you need. The Vertical fill form seal can be supplied for manual product loading, or provided with automatic loading systems:like pumps, volumetric and auger loaders. It can also be integrated with assembly equipment. Call us at 631-804-9625 to discuss your application, or send email.